Both the rooster and pheasant are considered good luck symbols in Chinese culture. It is not difficult to imagine Trump’s flamboyant, made-for-reality-TV communication-style to be one of the best arguments against American democracy the Chinese government could ever have. Even before his innauguration, the signs were clear: Mr. Trump’s tough-on-China posturing, his relentless attack on globalization, the recent defeat of the Trans-Pacific Partnership, which he vehemently opposed, have only strengthened China’s international influence. Yet despite this, Trump’s autocratic attitude and his penchant for backroom deals may be as close to a Communist leadership-style as any U.S. president in recent memory. Before Mr. Trump even took office his transition team began investigating the Department of Energy to gather the names of government employees who have been involved in climate change initiatives. A similar hunt is underway at the State Department for information about staff involved in activities to promote gender equality. In the technology domain, with his cabinet apointments Trump appears to be aggressively moving toward dismantling net neutrality rules so that the distribution of online content will be easier for large organizations to control. Arguably even worse, Trump’s pick for CIA director Mike Pompeo has called for an increase in surveillance and the execution of Edward Snowden. Permissioned blockchains that look superficially like a new world, but only give institutions a back door through which to manipulate. We can expect this process of claiming and co-opting the strategies of the competition to intensify over the course of 2017. While many of these innovations will turn out to be successful, some will also be destined for the dust heap. 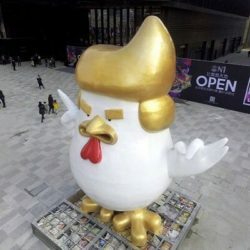 That may make Donald the Rooster a fitting symbol for this phenomenon, a man who, as one of the New York Times’ readers explained, “shamelessly tries to take credit for everything”, embodied by the crowing rooster, the animal who thinks he’s responsible for the sunrise.